Last week, a team of 20 incredibly bright high school students descended upon the University of Maryland's physics building for a special kind of boot camp. They were all vying for the opportunity to travel to this year's International Physics Olympiad in Estonia – an Eastern European country just south of Finland. The 43rd annual competition will feature laboratory and theoretical exams for five students from each of the over 80 countries represented. I had the opportunity to meet with the students and coaches of the U.S. team while they trained for the competition, and I was immediately impressed with the topics they were covering. These students, some of whom were just finishing their sophomore year, were handling Lorentz transformations with the confidence of a college sophomore. In addition to lectures on topics like special relativity, the students also took exams and practiced in the lab in preparation for the weeklong competition in July. Only five students can travel to the competition, however, so this week also served as the final step in a long selection process. 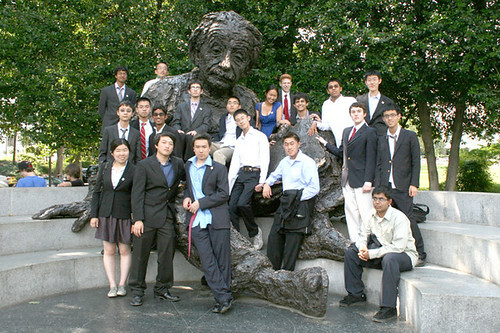 The 20 finalists for the 2012 U.S. Physics Olympiad Team. Image Credit: Matthew Payne/AAPT. Earlier this week, the American Association of Physics Teachers – the organization responsible for training and selecting the U.S. team members – announced the five finalists who will travel to Estonia. Although the competition will be important, the coaches told me that the Olympiad environment tends to foster collaboration rather than competition. The students develop friendships with not only their teammates but also their international peers. One coach and alumni of the program, Jason LaRue, told me about his experiences traveling to Iran for the 2007 Olympiad. Tensions between the U.S. and Iran didn't seem to matter to the students, and they found common ground through mathematics. In fact, an Iranian student helped LaRue draw a Farsi symbol because it looked like something they both knew about from physics class: the 'ket' symbol from Quantum Mechanics. Regardless of how they fare in Estonia, this year's team will surely find some rewarding experiences abroad. We wish them the best of luck on their theoretical and laboratory exams later this summer. The five member traveling team was announced on Wednesday during an awards ceremony. Image Credit: Matthew Payne/AAPT. For bios of the 20 U.S. team finalists and their coaches, check out this page from AAPT. 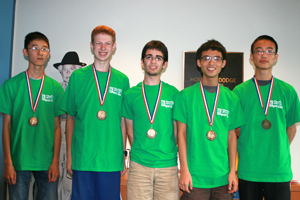 To learn more about the team's past results, see this APS News article about last year's team.